District Elder Reginald T. Cox was baptized in Jesus’ Name in 1993 at Faith Apostolic Church in Birmingham, Alabama and filled with the Holy Ghost in 1994 at the Church of Jesus Christ in Washington D.C. Pastor Cox has served as Youth President at Greater Faith Temple Apostolic Church in San Antonio, Texas; Brotherhood President at Bread of Life Apostolic Church in Mannheim, Germany; Sunday School Superintendent at Deliverance Apostolic Church in Fort Leavenworth, Kansas; and various positions at Greater Christ Temple Apostolic Church before being appointed as Pastor in April, 2008. In addition to Pastor Cox’s labor in the Kingdom of God, he also served his country faithfully in the U.S. Army as a signal corps officer before retiring as a lieutenant colonel in November 2008. Pastor Cox is currently employed as a JROTC Senior Army Instructor where his role is to motivate young people to be better citizens. 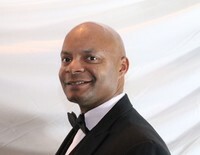 Pastor Cox holds a Bachelor of Science degree in Computer Science from Alabama A&M University, a Master of Arts Degree in Computer Resource Information Management from Webster University and a second Masters degree in Counseling from Colorado Christian University. With First Lady Erica Cox at his side, God has given Pastor Cox the wisdom and knowledge to help and assist people as they endeavor to reach their full potential in the Lord. He and his wife exemplify a marriage ordained by God. They have raised a beautiful daughter and four wonderful sons.